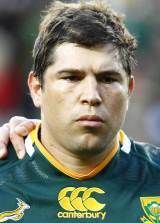 Alberts took his bow in domestic rugby for the Golden Lions in 2007. Having impressed, he moved to the Sharks in time for the 2010 season. After impressing in the 2010 Super Rugby season - including a man-of-the-match display against the Bulls in the semi-finals - he was included in the Boks squad for the 2010 northern hemisphere tour. He made his debut against Wales and scored a try in the process. And his remarkable run continued as he scored tries against Scotland and England in the next two weeks. He went on to continue his rampaging form during the 2011 Super Rugby season for the Sharks and was later included in the Boks squad for the Tri-Nations. Having impressed Peter de Villiers, he was named in the 30-man squad for the World Cup.